SACRAMENTO, Calif. (CN) – Capitalizing on one of California’s longest stretches of economic growth, Gov. Jerry Brown said Wednesday he will continue to prepare for a “lurking” recession by adding billions to and “filling up” the state’s rainy-day fund. In his 16th and final budget proposal as governor of the Golden State, Brown introduced a $131.7 billion general-fund budget stocked with major gains for education, transportation and money to fend off future recessions. General-fund spending ticked up 5 percent in the proposal that kicks off six months of negotiations between Brown and lawmakers. The $190.3 billion total budget bill includes an additional $58 billion in bonds and special funds. Brown’s proposal would bring California’s cash reserves to a record $13.5 billion for 2018-2019, a total he’s added to each year of his fourth and final term. He told reporters his successor should be preparing for bleaker economic days, not counting on continued surplus. “Out there is darkness, decline and recession. So good luck baby,” Brown said. Education spending receives a major boost in the proposal, particularly a program that funds additional resources for low income students. Brown wants to add $3 billion to the program, and K-12 spending per student would reach $16,085 – an increase of nearly $4,600 from 2011-12 levels. In his final spending plan, Brown is looking to create a fully online community college program that will provide working students a “flexible opportunity” to advance their careers. He says the 2.5 million Californians aged 25-34 without college degrees will particularly benefit from the new program. “These adults are at great risk during economic downturns and the impact of automation in the California workforce,” Brown’s budget states. The budget blueprint would also fund newly-passed legislation which waves tuition for first-time community college students for their first year. Like many states, California is basking in the current stock market growth and the financial success of its highest earners. California’s general fund is largely sourced by personal income tax revenues and the current fiscal year is looking like a banner year. According to the state’s Legislative Analyst’s Office, tax collectors could rake in $7.5 billion more in taxes than projected in the 2017-18 budget. “In a volatile and uncertain world, fixing the budget is a perpetual struggle and one we must approach with wisdom,” Brown said in a message to the Legislature. The good financial news continued to roll in Wednesday as State Controller Betty Yee reported that last December’s personal income tax revenues were $2.79 billion above current budget expectations. The state’s top fiscal officer applauded Brown’s latest budget iteration for planning against the uncertainty of the federal government’s recent tax overhaul. On the heels of a new gas tax that roiled state conservatives, Brown proposes adding $4.6 billion in transportation funding. He wants most of the money to go toward immediate fixes on state highways, bridges and local roads, along with $721 million toward public transit and rail projects. State Republicans, who are attempting to block the gas tax in a statewide repeal effort, said Californians shouldn’t pay higher gas taxes considering the state’s budding reserves. Assemblyman Jay Obernolte, R-Hesperia, contends the substantial surplus is proof that Californians “pay too much in taxes. “In a perfect world, the surplus would be returned to taxpayers,” Obernolte, vice-chairman of the Assembly Budget Committee, said in a statement. 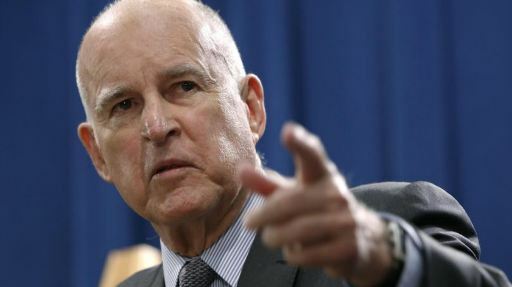 Brown’s second stint as governor started with the Golden State mired in budget cuts and furloughs in the wake of the Great Recession. He inherited $27 billion deficit when he began his third term in 2011, and notes that his current proposal assumes a “healthy one-time surplus” of more than $6 billion. Marijuana will also pad the state’s 2018-19 revenues, with Brown expecting the state to rake in $643 million in excise taxes from legal pot. Lawmakers have already moved to protect California’s newest industry, proposing a measure that would bar law enforcement agencies from cooperating with federal drug agencies on pot busts. Brown suggests using the legal pot windfall to repay a $135 million general-fund loan the state used to develop and implement new marijuana licensing laws. He says the May revision will include more specific cannabis-related budget items. The state’s newly enacted cultivation tax is $1.29 per ounce of cannabis, along with a 15 percent retail sales tax. State Sen. Holly Mitchell, chair of the Senate Budget Committee, says she will pursue more money for social services over the next five months of budget talks. “Here, modesty is not good enough. I would like to see more increases in social security income and cost of living adjustments, and investments in human services, particularly as it relates to deep poverty,” Mitchell, D-Los Angeles, said of the budget proposal. State Attorney General Xavier Becerra applauded Brown’s final budget proposal. “I look forward to working with Gov. Brown and the Legislature to ensure the hardworking men and women of the Department of Justice can do even more to promote public safety, enforce California’s laws and defend the state’s interests against federal overreach,” Becerra said in a statement.